A good bag is something that every laptop owner could use but there are so many bags on the market that it can be quite hard to choose one. In this review I'm taking a closer look at the Mohave Tui backpack from Ecogear, this bag sets itself apart from the pack due to its eco-friendliness. 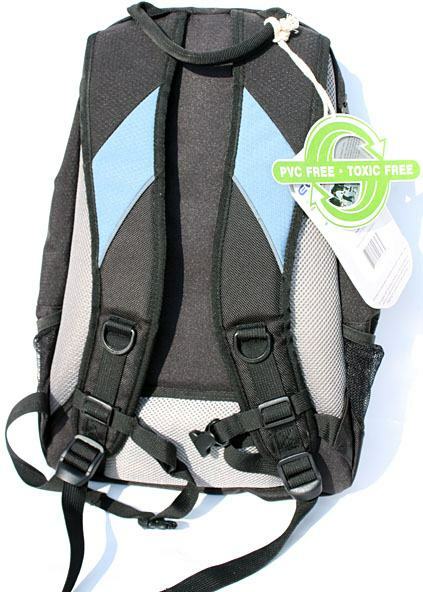 The company claims it does its best to design bags that have a smaller impact on the environment than traditional bags, the Mohave Tui is part of the company's Genus backpacks, a line of bags that use PVC-free materials, recycled plastics, renewable materials and non-toxic dyes and components. The Ecogear Mohave Tui ships in three color combinations; garnet/ebony, charcoal/ebony and slate/ebony. As you can see on the photos below the version I have is the slate/ebony model, it features a stylish combination of blue and black. 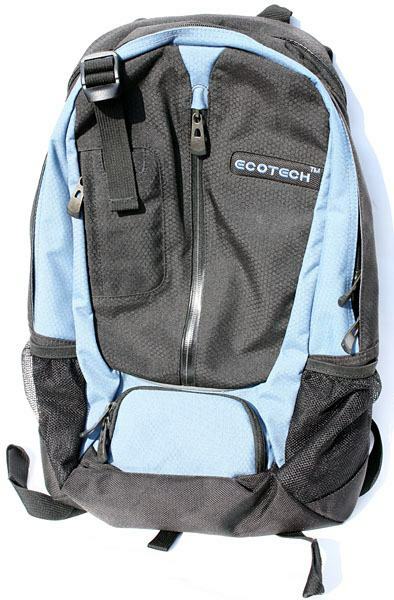 The front of the bag features quite a lot of pockets and has a medium-sized Ecotech logo. Size: 18.5" x 12" x 6"
Pictured below is the rear of the bag, there's a lot of padding and cushioning to make the backpack comfortable to wear. 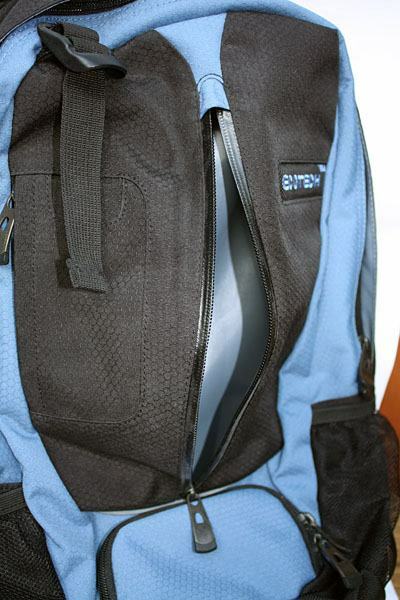 You can also see the top handle on this picture, this component is one of the few flaws of this product, compared to the rest of the backpack the handle looks and feels pretty cheap. It could use some padding because the current design feels too harsh. Lets explore the Mohave Tui with some photos to give you an idea of its features. 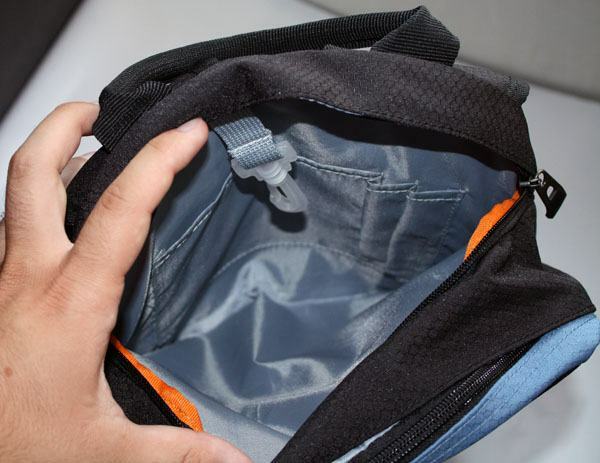 Located on the front of the backpack is a large pocket with water resistant zippers, it gives you quick access to items like your phone and digital camera but you can also fit a couple of small bottles in this area. 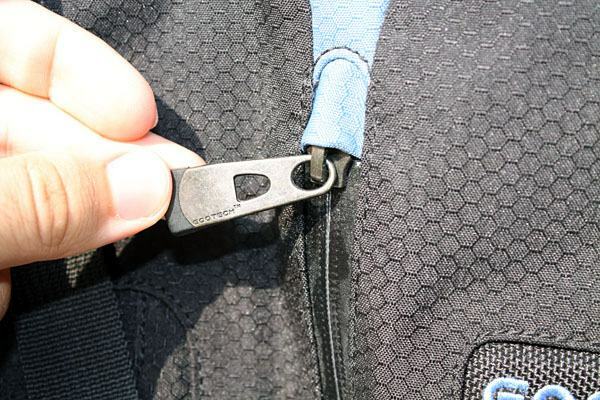 All pockets have large zippers with plastic tips and the brandname "Ecotech" is etched into the metal of each zipper. The Mohave Tui features a dedicated pocket for your MP3 player. 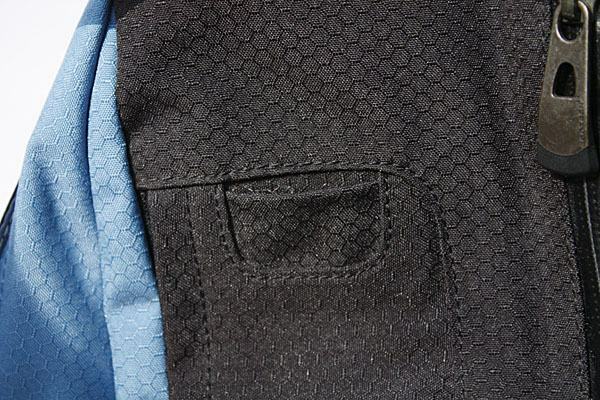 The interior of this pocket is lined with a soft velvet-like fabric to prevent scratches on the screen of your MP3 player. The top of the MP3 player pocket has a small port for your headphones, enabling you to listen to your player without having to take it out of your bag. 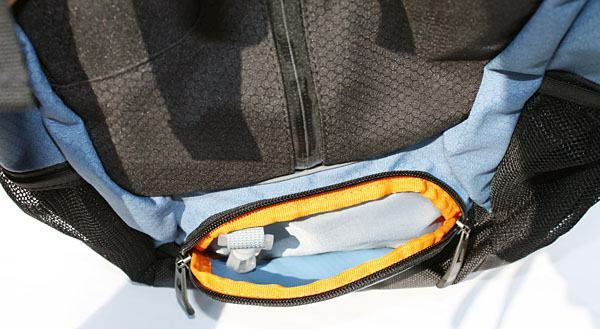 A third front pocket can be found at the bottom, the interior of this pocket features an orange highlight and it has a plastic clip that could be used to secure your keys. 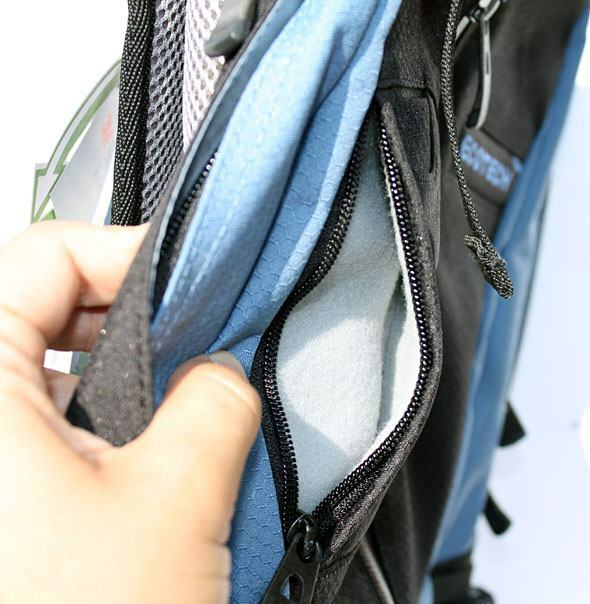 Another easy-to-access pocket can be found at the top of the bag. It's not that big but there's enough room for a couple of pens and items like your keys, phone or digital camera.